Isn’t dandelion just a weed that pops up in your backyard time and again? Well, it depends on whether you’d call an anti-inflammatory, detoxifying herb a ‘weed’. Dandelion teas are some of the most popular slimming and detox teas on the market today. Made using dandelion roots or leaves, they support and encourage the body’s natural cleansing mechanisms. These result in improved liver and kidney function, better digestion, reduction of bloating, regulation of diabetes, and prevention of urinary tract infections. A soothing, holistic herbal brew, dandelion tea is often accented with mint, lemon, cinnamon and honey, or paired with the additional benefits of hibiscus and chamomile. Tea blends prepared with dandelion and black tea bases are also catching on. Our ancestors were rather quick to note the benefits of dandelion leaves and roots. Their usage has been recorded in ancient medicinal practices of China, Arabia, parts of Europe, and native America. Dandelion was used to treat everything from digestive disorders, to menstrual cramps, to all sorts of inflammations. Dandelion root tea is “very aromatic” and has a “deep, earthy flavor”. Some tea drinkers can find it “bordering on bitter”, a problem that is easily solved by adding lemon, mint, ginger or honey to the mix. In fact, most herbal tea blends featuring dandelion root include sweeter, fragrant additives such as hibiscus or cinnamon to set off the bitterness. Dandelion leaf teas have a “milder”, “grassy”, “pleasantly green” taste that usually gels well with honey, and “can be had hot or cold”. Steep your dandelion tea in a cup of boiling water for 3-6 minutes. Add in a dash of lemon, mint, cinnamon or ginger, and sweeten it with honey for a delicious, well-rounded flavor. 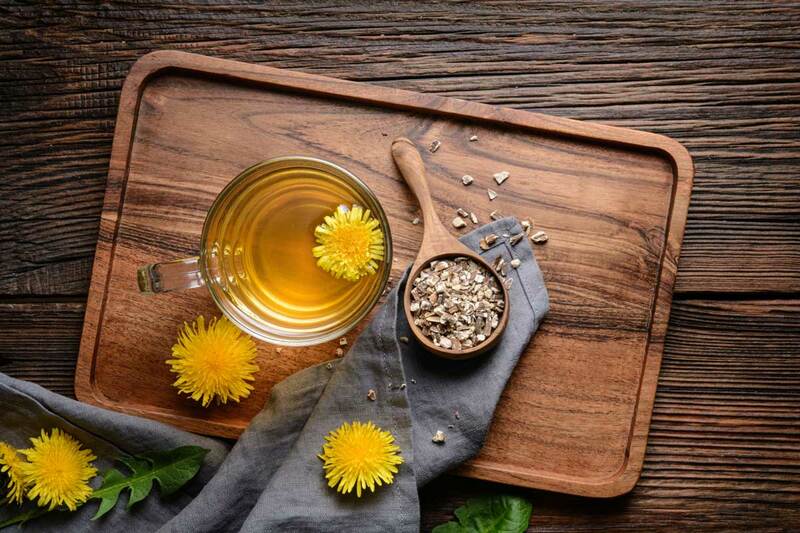 There are tons of interesting dandelion root and leaf based herbal teas on the market that incorporate floral herbs, warming spices and refreshing flavor accents. Try them out! Lastly, to make the most of the detoxifying properties of dandelion, it is best to purchase authentic, organic dandelion root and dandelion leaf teas. Dandelion root teas retain more of their medicinal properties when unroasted, though roasting does give them a full-bodied taste that can easily replace your daily caffeine-rich pick-me-up.